Great Scott, a green sea turtle, was discovered on the beach on South Padre Island in distress. Staff at Sea Turtle Inc. believe the turtle became entangled in some type of debris offshore. SOUTH PADRE ISLAND — Patrollers on ATVs spent the summer searching the entire beach for nesting sea turtles. However, these aren’t the only turtles they keep an eye out for. Every so often, they also discover sea turtles in desperate need of help, like the ones that are entangled in fishing line and are unable to free themselves from it. At least 115 marine species are impacted by entanglement, including mammals, turtles, birds, fish and crabs. For air-breathing animals, such as the green sea turtle, entanglement can prevent them from being able to swim to the surface, causing them to drown. Fortunately for turtles, the help they need can be provided by the local sea turtle hospital, Sea Turtle Inc.
One such case was discovered by ATV patroller Steve Fowler. 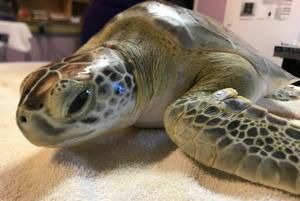 As he was on his 64-mile search up-and-down the beach in May, he happened to come across Great Scott, a green sea turtle who is now one of Sea Turtle Inc.’s latest patients. Great Scott was found lethargic, sitting in a high tide line with an injured front flipper and tar on his shell. Sea turtles don’t come out of the water unless they’re sick, nesting or injured. So, the Sea Turtle Inc. patroller knew it wasn’t normal for the turtle to be sitting there and he immediately took Great Scott to the facility. On arrival, patients are given antibiotics, X-rays, blood tests and sometimes even CT scans when needed. Great Scott came into the facility with a variety of issues, so he’s a patient that especially needed these thorough examinations. Based on Great Scott’s weight, veterinary technicians determined the turtle was less than 5 years old. Green sea turtles like Great Scott don’t reach sexual maturity until they’re around 20 to 25 years old, so veterinary technician Nina Nahvi ruled out nesting as one of the reasons Great Scott was out of the water. Sea Turtle Inc. personnel also noticed Great Scott only has a nub for a right front flipper. Nahvi determined Great Scott’s injury was not caused by a predator attack because his flipper looks clean and rounded. If it had been caused by a predator attack, it would have looked like the limb was torn off. This indicated the turtle’s injury was most likely the result of entanglement. “Now, I don’t know necessarily if it’s entanglement in fishing line because sometimes turtles get entangled in onion sacks or other marine debris,” Nahvi said. “However, by the looks of it, it most likely has something to do with humans,” she added. Sea Turtle Inc. personnel say they see a lot of turtles come into the facility with injuries due to entanglement or with fishing hooks in them. Within the past couple of weeks, the nonprofit rescued two sea turtles entangled in fishing line at the jetties at Isla Blanca. Those two turtles survived. However, not all of them do. Unfortunately, the nonprofit has also found several dead turtles entangled in fishing line in that area within the past few months. Sea Turtle Inc. personnel say they “see tons of fishing line” every time they walk onto the jetties to rescue a turtle. “It’s not just sea turtles. Any animal like sea gulls and pelicans could also get entangled in that line,” she added. Sea Turtle Inc. personnel say there’s “a simple solution” to this problem. Gathering and appropriately disposing of hooks, bobbers and fishing line could help prevent more sea animals from getting injured. Nahvi recently increased his water level to encourage diving. Every morning, Great Scott dives down to the bottom of the tank to take a bite out of his high calcium shrimp and mackerel diet. In due time, Great Scott will eventually be released and be able to return back to his home in the ocean. If you see sick or injured sea turtles on South Padre Island, call Sea Turtle Inc.’s 24-hour stranding hotline at (956) 243-4361. At least 115 marine species are impacted by entanglement, including mammals, turtles, birds, fish and crabs. Worldwide, at least 200 species are impacted. For air-breathing animals, such as the green sea turtle, entanglement can prevent them from being able to swim to the surface, causing them to drown. Alana Hernandez is a Reporter for the Valley Morning Star. She can be reached at ahernandez@valleystar.com or (956) 430-6239.